This article was first posted on July 1, 2002, updated on May 1, 2007. Looking back over the past twelve years, I thought it might be interesting to see how some popular investment strategies have fared since I quit work in November 1994. During that time, we've seen a five year bull market followed by a three year bear market. Over the past five years the stock market has staged a significant recovery. The Dow reached new highs and the S&P500 came close. Only the NASDAQ continues to lag at about half its year 2000 peak. The good news is that anyone with a reasonably diversified portfolio did just fine. It's not bad news, but, of course, some strategies performed better than others. The chart below shows the results for a $100,000 starting balance and a 4% of assets initial withdrawal indexed annually for inflation. Vanguard index funds are used whenever possible in this analysis. If you want to check the calculations, you can download the Excel spreadsheet, click here. All portfolios showed gains for 2006. The top gainer was the Warren Buffett portfolio with a 17% increase in value for 2006. The 100% fixed income portfolio had the worst performance eeking out a small gain of 0.33% for 2006. It remains in last place over the twelve-year time frame. The Harry Dent portfolio showed the strongest performance for the twelve-year period nearly quadrupling its $100,000 starting value -- even after 12 years of retirement withdrawals. Most of the various safe withdrawal studies done over the years assume some combination of an S&P500 index fund and fixed income assets. While the Retire Early study used 3-month commercial paper for the fixed income allocation, most retirees only keep one year's worth of expenses in a money market fund and the balance of their fixed income allocation in a ladder of CDs or bonds. To more closely model retirees' actual practice, an allocation of 4% of assets to Vanguard's Prime Reserve Money Market Fund (VMMXX) and 21% to Vanguard's Short-Term Corporate Bond Fund (VFSTX) was used for the 25% fixed income allocation. (1)....Dollar value of 4% of assets initial withdrawal indexed to the CPI-U in future years. (2)....Annual withdrawal as a percent of previous year's Dec 31 balance. Retirees following this approach over the past ten years have been generally pleased with the results. Even after taking eleven years of inflation-adjusted withdrawals, the account balance has more than doubled as of Dec 31, 2006 to $240,303 from its $100,000 initial value. The 25% fixed income allocation has also grown from 6.25 years' worth of annual withdrawals to 11.16. The Jan 2007 withdrawal of $5,387 amounted to just 2.24% of assets. If even annual rebalancing of your retirement portfolio sounds like too much of a job, Vanguard's Balanced Index Fund may be a solution. The fund maintains a 60% allocation to the Wilshire 5000 Index and 40% to the Lehman Aggregate Bond Market Index. The expense ratio is 0.20%. Retirees following this approach over the past ten years have been generally pleased with the results. Even after taking ten years of inflation-adjusted withdrawals, the account balance has more than doubled as of Dec 31, 2006 to $224,320 from its $100,000 initial value. The 40% fixed income allocation has also grown from 10.00 years' worth of annual withdrawals to 16.66. The Jan 2005 withdrawal of $5,387 amounted to just 2.40% of assets. Some retirees just can't stomach the ups and downs of the stock market and prefer to keep all their retirement assets in fixed income securities. Few experts advise this, but folks do it anyway. After two years of declines the portfolio recovered slightly in 2006, but remains in last place overall. The January 2006 withdrawal amounted to 4.51% of assets. An allocation of 4% to Vanguard's Prime Reserve Money Market Fund (VMMXX) and 96% to Vanguard's Short-Term Corporate Bond Fund (VFSTX) was used for this all fixed income approach. Two prominent early retirees have followed the 100% fixed income approach. Your Money Or Your Life author Joe Dominguez invested in only US Treasury securities when he retired in 1969 at age 31 and continued to champion that approach up until his death in 1997. Dominguez retired in 1969 with a $100,000 portfolio and $7,000 per year in living expenses. An August 1996 Kiplinger's Personal Finance Magazine article revealed that Dominguez was then living on about $13,000 per year. To keep pace with inflation, $7,000 in 1969 would need to grow to $30,360 by 1996 to maintain the same purchasing power. Dominguez managed this loss of spending power with unusual living arrangements (he lived in a group home with about 30 other people) and a lot of composting and the washing and reusing of tin foil and wax paper -- a strategy that few early retirees would tolerate. Paul Terhorst, author of Cashing in on the American Dream: Retire at 35 limited his investments to a laddered portfolio of FDIC-insured Certificates of Deposit (CDs) when he retired in 1984. His web site ( http://www.geocities.com/TheTropics/Shores/5315/ ) reveals he holds "a more traditional portfolio heavily weighted with low-cost [equity] index funds" today. 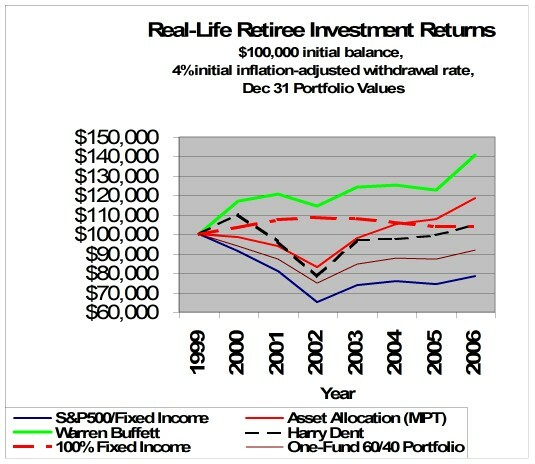 To illustrate an MPT portfolio the nine-asset class Bernstein-inspired portfolio described in a December 2000 Smart Money magazine article was chosen. This portfolio covers the gamut from large cap to small cap US stocks, international equites, emerging markets, REITs, and short term bonds. The 40% allocation to Vanguard's Short-Term Corporate Bond Fund (VFSTX) was changed to 36% VFSTX and 4% Prime Money Market Fund (VMMXX) to provide the one year's worth of expenses in a money market fund that most retirees maintain. 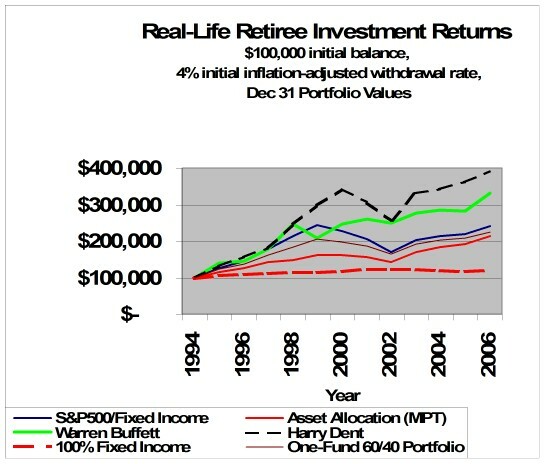 While the MPT portfolio value has trailed the simple S&P500/fixed income portfolio (No. 1 above) by some 12% as of Dec 31, 2006, advocates of this approach like its reduced volatility and sterling academic recommendations. Which brings us to an important investing truism -- it's OK to under perform as long as you're pleased with the results and proud of what you are doing. The efficient market theorists don't like it, and warn that it's too risky, but many investors eschew index funds and hold individual stocks or concentrate on one or more industry sectors. Most of the research I've seen shows that no more than 20% of the people who hold individual stocks out perform the S&P500. If you're a member of this minority, obviously you're pleased. Here's a couple of concentrated portfolios I've followed over the years. Warren Buffett, Chairman and CEO of Berkshire Hathaway is the second richest man in the United States after Bill Gates. It's even more noteable that he's one of the few members of the Forbes 400 who got there by investing in stocks rather than founding a successful business or inheriting his fortune. His investment strategy is to buy and hold positions in a few companies and watch them very carefully. Three stocks (American Express, Coca-Cola, and Wells Fargo) make up nearly half the value of Berkshire's $61.5 billion stock portfolio. The Top 7 stocks comprise two-thirds of the portfolio. For the purposes of a retirement portfolio, a mix of 75% Berkshire Hathaway stock, 4% money market fund and 21% short-term corporate bond fund was chosen for the example below. Through December 31, 2006, the value of the Warren Buffet portfolio exceeded the S&P500/fixed income portfolio by 38%. If you want to learn more about how Mr. Buffett selects stocks, one good book on the subject is Buffettology by his daughter-in-law Mary Buffett . Harry Dent made perhaps the most prescient forecast of the great bull market of the 1990's in his 1993 book The Great Boom Ahead. His theory of demographic investing sees the Dow Jones average hitting 41,000 by the year 2008. The chart below summarizes Dent's long-term forecast. Dent favors three sectors of the economy during the 1982-2008 boom: technology, health care, and financial services. More troubling is the 12-14 year long recession/depression from 2009 to 2022. The deflation during that period will make long-term US Treasury securities the investment of choice. Three sector funds were used to build the Harry Dent portfolio below. The Vanguard Health Care Fund (VGHCX) was chosen for its low expense ratio. Since Vanguard doesn't offer similiar specialized funds in other areas, the Fidelity Computer Technology (FDCPX) and Financial Services (FIDSX) sector funds are a convenient choice though personally I'd gag at paying the 3% front-end load. (Note: Fidelity recently stopped changing sales loads on its funds.) My preference would be the purchase of a LTB&H basket of stocks in each industry sector. Harry Dent has written four books on demographic investing. The first book, The Great Boom Ahead is the best. Like most sequels, the subsequent installments lack the impact of the original work. How about some losing portfolios? There's no shortage of losing strategies you could have employed over the past nine years. Market timing, day trading, Internet stocks with no record of earnings, etc. likely would have lost you money unless you were one of the fortunate few who sold out at the top. Retirees who see the value in holding at least 5 years' worth of expenses in cash and CDs and maintain some level of diversification in their portfolios would have rejected most of these losing investment approaches on principle alone. What if you retired in January 2000? If you happened to retire in January 2000, just before the stock market peak, the three year long bear market took it's toll. While all six portfolios have recovered from their lows, Only the 100% fixed income, Warren Buffett, and MPT portfolios exceed their $100,000 starting balance after six years of annual retirement withdrawals. The worst performer was the 75% S&P500/25% fixed income portfolio. Oddly, the "risky" Harry Dent portfolio is within a few hundred dollars of its starting balance -- even after over $25,000 of withdrawals. The chart below illustrates the results. What to conclude from these results? There's a reason Warren Buffett is regarded as the most successful stock market investor of all time. Copyright � 1996-2007 John P. Greaney, All rights reserved.